All 30 NBA teams are worth at least $1bn (£719m) for the first time in history, according to Forbes. 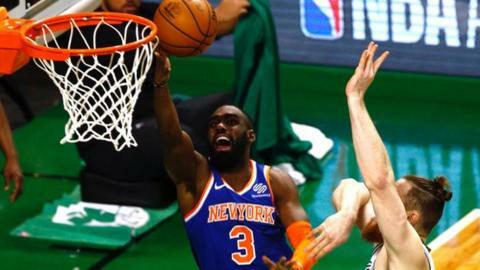 International growth and lucrative US television deals are underpinning basketball's growth according to the business magazine, with franchises now worth an average of $1.65bn. That is a 22% rise on 12 months ago. New York Knicks are the most valuable at $3.6bn, ahead of LA Lakers ($3.3bn) and Golden State Warriors ($3.1bn), who overtake Chicago Bulls ($2.6bn). The Warriors - NBA Finals winners in 2017 - have been able to increase ticket prices off the back of their success in recent seasons and their value is 19% higher year-on-year. The Knicks have been able to grow revenues after upgrades to their venue - Madison Square Garden. They are now the sixth most valuable sports team in the world, behind football clubs Real Madrid, Barcelona and Manchester United, baseball's New York Yankees and the NFL's Dallas Cowboys. Cleveland Cavaliers - NBA champions in 2016 - are 15th in the list of valuations at $1.3bn but lost money during the last year, thanks in part to a $134m wage bill servicing the likes of LeBron James and Dwyane Wade. According to Forbes, the lowest valued team is the New Orleans Pelicans at $1bn. Continuous growth in China - where an estimated 300 million people play the sport - has been integral in boosting the value of franchises. A new nine-year television contract in the US has also delivered $24bn for the NBA - three times the value of the previous deal. In addition, NBA teams played five fixtures overseas in 2017 in order to boost the sport's appeal and a fixture between the Philadelphia 76ers and Boston Celtics has already been played in London in 2018. Such figures helped some franchises to rapid year-on-year growth, with Forbes estimating the Philadelphia 76ers are worth 48% more than a year ago. The success of the league has prompted a number of takeovers, with restaurateur Tilman Fertitta paying $2.2bn for the Houston Rockets in October. Will it be too cold for a Winter Olympics? Read more on Winter Olympics 2018: Will Pyeongchang be too cold for a Winter Games? How to get into basketball - a fun and fast-moving team sport that will burn up to 600 calories per hour. Great Britain's men's team failed to pre-qualify for the EuroBasket 2021 after the women's squad reached EuroBasket 2019.